Did you ever have one paragraph of a book jump out at you, giving you immediate direction for the path ahead? That’s what happened to me as I read Dinty W. Moore’s book, Crafting the Personal Essay, a Guide for Writing and Publishing Creative Nonfiction. Spurred on by that image, I began making “bricks” for my new book, Creative Grandparenting. The first “brick” will show how I made pajamas for all eight of the grandchildren and myself out of happy face material. I designed a funny instruction booklet to accompany each set. One brick might be about taking the grandchildren to the ocean; another may tell how I taught them Spanish during one of my “Oma’s Camp” sleepovers. 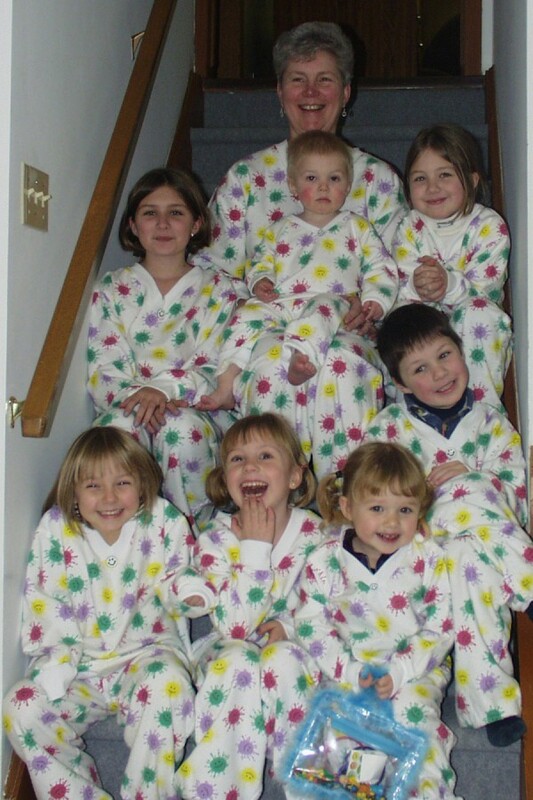 I’ll show “Oma’s Sewing Camp,” where five grandchildren from ages six to fourteen sewed their own pajama bottoms. 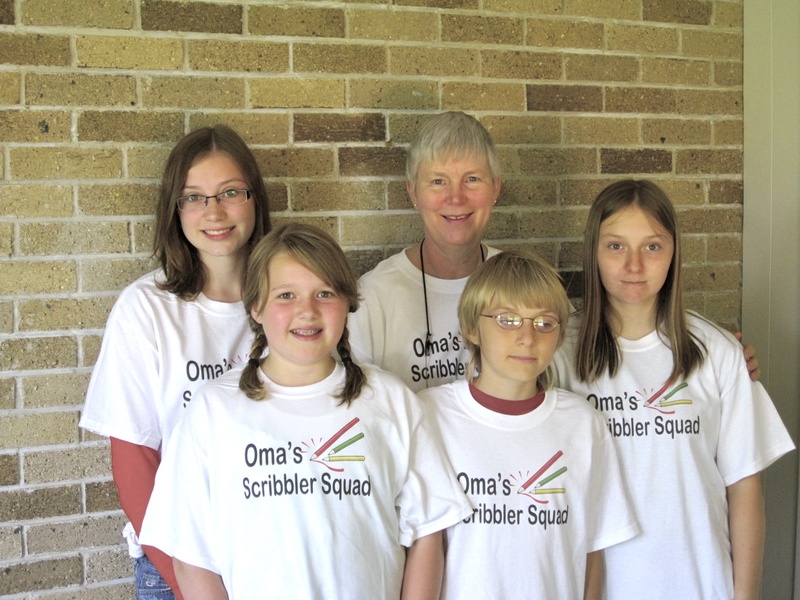 At “Oma’s Writing and Illustrator Camp,” I taught them how to write stories and then edited them. I invited a real illustrator to teach them for a day. Those sleepover stories will all go into one pile. There will be a pile of bricks with lists of games we play, music we listen to and fun activities we do, like writing in secret code, going on scavenger hunts and making candy necklaces. Another pile will contain the mouse stories I’ve written for my grandchildren over the past ten years. 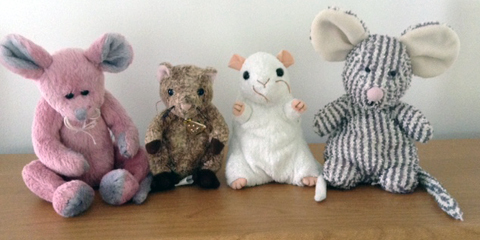 Three stuffed toy mice, Sniffy, Nibbles and Twitch, sit on Oma’s shelf. When she’s not looking, they come to life and go on wild adventures together—rafting, fishing and surfing on the ocean. They go trick-or-treating, have a birthday party, and generally cause havoc in their little world. I imagine other grandparents will want to read these stories to their own grandchildren. Making bricks is hard work. It’s messy, it’s exhausting, and it’s discouraging some days. But I envision what a sturdy “wall” it will become when I’ve placed all my “bricks” in position. My critique group will help me improve each story. I’ll let friends read them and see how they respond. Then I’ll rewrite and revise and rewrite some more. My goal is to make each “brick” as perfect as possible before assembling it. I’ll need help putting my final “wall” together—an editor, a cover designer and a publisher. I hope it will one day be an inspiration to many grandparents and the special little people who have brought so much joy to their lives. My nine-year-old grandson and his little sister stayed with us for nine days recently. Rylie loves to play with the props I made for my children’s story, “The Three Mice.” Owen likes to make videos, so we used the props and mice to act out the story. Owen did a superb job of moving Baby Mouse around the set. Check out the video we made. Read it to your children or grandchildren. You can find it at: http://www.youtube.com/watch?v=tY8RpqnLdZU.